THIS ARCHIVE IS UNDER CONSTRUCTION. 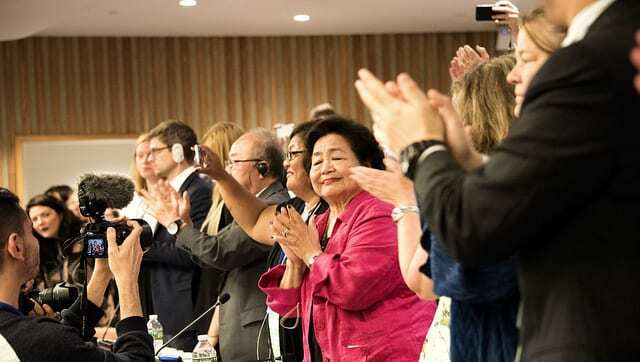 Members of the International Campaign to Abolish Nuclear Weapons (ICAN) celebrate the adoption of the 2017 Treaty on the Prohibition of Nuclear Weapons at the United Nations in New York, 7th July 2017. ICAN was awarded the 2017 Nobel Peace Prize for its advocacy for this treaty. Photo by Clare Conboy courtesy of ICAN. The history of the development of nuclear technology and the subsequent protest against its use is hidden in the office buildings, universities campuses, apartment buildings, parks, and streets of New York City. The city’s role as an international center of business and scientific research also made it the epicenter of numerous visible protest movements. The dark side of this prominence is that New York also came to be seen by many as a potential target for nuclear attacks. By looking at spaces within New York City and the way that people have projected nuclear fears onto the city, the NYC Nuclear Archive aims to make the sprawling story of the nuclear age more manageable while bringing to light the hidden story of nuclear New York. The NYC Nuclear Archive is based largely on the “Nuclear New York” online archive compiled by Catherine Falzone. Her work has been republished here with her permission. Some pages have been added or edited by other authors, who are credited on the individual pages.